Ross County co-manager Stuart Kettlewell credits the Staggies’ 2011 Challenge Cup win with giving his side the impetus to win promotion the following year. Midfielder Kettlewell was part of Jimmy Calderwood’s County’s side which defeated Queen of the South 2-0 at McDiarmid Park, but narrowly avoided finishing in the First Division relegation play-off places in the same campaign. Following Derek Adams’ return as manager the following season, County went on to lift the league title, but he feels the cup triumph was a cornerstone in the Staggies’ success. 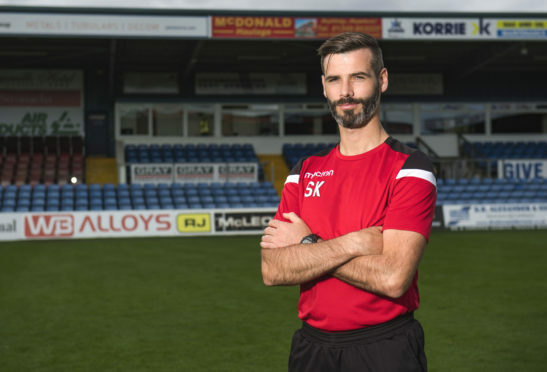 Kettlewell, who will serve the second of a three-match touchline ban for tomorrow’s IRN-BRU Cup semi final at home to East Fife, said: “I think this can be a really good catalyst for the rest of the season. “We were fighting relegation at the time, but we won the game and managed to get ourselves out of trouble. “The next season we went in with a similar group of players and won the league, so I always trace it back and see it as something that might have helped the club kick start some good form and achieve some great things. The cup success of eight years ago was the first silverware of Kettlewell’s career, however the 34-year-old revealed preparations were far from straightforward. Kettlewell added: “It was a strange one that year. The game was meant to be played around November time, but ended up being played in April. “We had genuinely been preparing for the game a day or two before, when Willie McStay was manager. I seem to remember George Adams came in when we were in the indoor hall and told us the game was off. “At that point they decided to delay the game to April, it must have been due to the fixtures and the weather. “We knew we were in a cup final but it was a long time coming, especially having prepared for it. “By the time we got to the cup final, Jimmy Calderwood was in charge so quite a lot had changed.